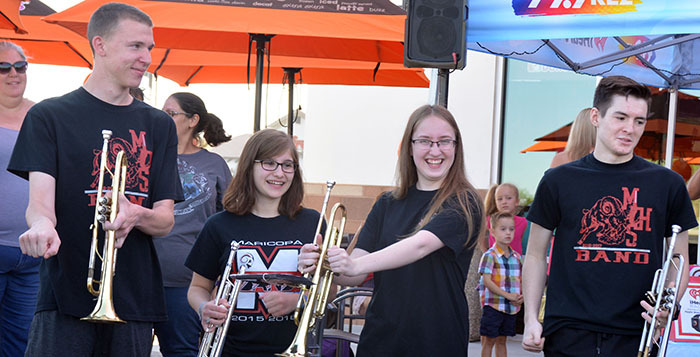 Members of the Maricopa High School band continued to perform during the summer in preparation for an early start to the school year. It will still be July when students return to class in the Maricopa Unified School District, Legacy Traditional and Sequoia Pathway this year. In exchange for an expedited first day of school, kids will get to spend an additional week off during fall, winter and spring breaks. The changes at MUSD come as part of a modified calendar adopted by the school Governing Board in early 2017. The district operated an additional year under its traditional calendar to give families and staff time to plan ahead. The two charter schools then chose to follow suit. Back in 2017, parents voiced concern about childcare during the extended breaks and how the July start-date would negatively affect teen workers with summer jobs. Some educators in the district are also pleased. Kathy Fuentes, special education teacher at Saddleback Elementary School, has experience working under the modified calendar in another district. She loved it then and is looking forward to spending more time off in the cooler weather months of October and March. “It also gives families a week to take care of doctor appointments and other business and then a week, or so, to rest and relax,” Fuentes said. A sixth-grade teacher at Maricopa Wells Middle School, Rachael Isenberg, also likes the additional time she’ll have to schedule appointments and travel. Isenberg was on the district calendar committee and deliberated the reasons why the district should adopt the new schedule. “We considered things like getting kids out of the worst of the heat and continuity of curriculum and instruction,” Isenberg said. But the committee also looked at how the extended breaks could benefit educators and families. Isenberg said teachers often spent the one-week vacations in waiting rooms – cramming in medical appointments during break to avoid missing a day of school. She said the extended breaks could alleviate that. Even with its benefits, teachers said the new schedule doesn’t come without a degree of adaptation, especially with summer break. Many educators like Alicia Chin, a science teacher a Maricopa High School, teach summer school and participate in curriculum planning well into June. “I will only be able to take a couple weeks to myself before I need to be back to work again preparing for next year,” Chin said. MHS Music Director Ivan Pour called the schedule changes “minimal,” although the fall break is in the middle of marching band season. Beginning school in July means the marching band will have more time overall to rehearse, but Pour said he will have to reconfigure his spring programming because of the new schedule. This story appears in the July issue of InMaricopa.